The Howard Hughes Corp. officially began construction Thursday on its third mixed-use condominium tower in the Honolulu neighborhood of Kakaako, with a groundbreaking ceremony for Aeo, which includes what will be Whole Foods Market’s flagship Hawaii store. The Texas-based developer already has two other residential towers under construction, Waiea and Anaha, which are located nearby within the 60-acre Ward Village. The 54,000-square-foot Whole Foods Market is expected to open in about two years, possibly the first quarter of 2018, with Aeo opening sometime after that. Todd Apo, vice president of community development for The Howard Hughes Corp., told PBN that it expects to start demolition of the existing that Office Depot building on the lot toward the end of March. Office Depot is currently moving out of that space. Demolition will begin with the warehouses in the back of the Office Depot first, with construction fencing coming up around the project in mid-March. The parking lot of the project is expected to remain open until the end of March. Bohlin Cywinski Jackson is partnering with Architects Hawaii Ltd. on the design of the project. Layton Construction is the general contractor. Bounded by Queen and Kamakee streets, the block is behind the Ward Entertainment Center and also contains the former Nordstrom Rack. Plans for Aeo also include 12,000 square feet of retail and more than 700 parking spaces in a block-filling podium to be topped with a narrow high-rise offering about 466 residential units. No development cost was given for the project, which is named after the Aeo stilt bird that once lived the area. “[The project] is consistent with our mission of honoring the past as we look to build a better future for this community,” Vanderboom said. In November, the developer said that close to 35 percent of its units in Aeo are under contract. Howard Hughes also is developing a 43-story, 424-unit mixed-use mostly affordable tower that will include a Longs Drugs ground floor store called Ke Kilohana at 988 Halekauwila at the corner of Ward Avenue and Halekauwila Street. The project is expected to satisfy the developer’s affordable housing requirement set by state regulators. The Howard Hughes Corp. plans to start construction on its mixed-use condominium that will include Whole Foods Market’s flagship Hawaii location in the Honolulu neighborhood of Kakaako on Thursday, the Texas-based developer said. Located at 1001 Queen St., at the corner of Queen and Kamakee streets behind the Ward Entertainment Center, Aeo will include 466 units and a 54,000-square-foot Whole Foods Market store on the ground floor. 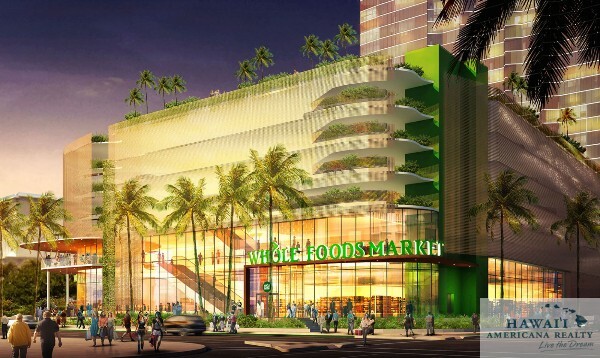 The tower and organic supermarket chain will replace Office Depot on the block that used to also house a Nordstrom Rack, which has relocated within Ward Village. During Halloween, a retailer selling costumes and other items for the late October holiday took the former Nordstrom Rack space, but has since closed. 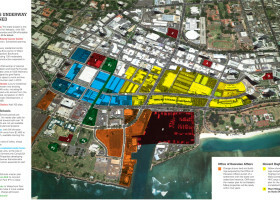 The Howard Hughes Corp.’s (NYSE: HHC) 60-acre Ward Village includes two mixed-use luxury residential towers — Waiea and Anaha — that are now under construction, as well as Aeo, Gateway Towers and Ke Kilohana at 988 Halekauwila St, which will include a Longs Drugs store. Today, Ward Village announced plans to welcome world renowned restauranteur Nobu Matsuhisa to the neighborhood. In late 2016, Nobu will move from Waikiki to a dramatic new space at the base of Waiea, Ward Village’s first flagship residential building. Nobu Honolulu will join an array of new restaurants and stores coming to Ward Village, including Merriman’s and Whole Foods Market, while offering its spin on contemporary Japanese cuisine with locally sourced fish and produce. The chefs will also showcase Nobu’s signature dishes such as Yellowtail Jalapeno, New Style Sashimi and Black Cod Miso. The Howard Hughes Corp. is opening sales for its third Honolulu condominium tower in its Ward Village master plan, Aeo at 1001 Queen Street, this weekend with 234 of the building’s total 466 units being offered to owner-occupants in a public lottery. The building, which is being designed by Bohlin Cywinski Jackson, will also have 60,000 square feet of retail, including Hawaii’s flagship Whole Foods Market store, is being built on the former Nordstrom Rack and Office Depot site behind the Ward Entertainment Center, is scheduled to be completed in 2018. It’s the third tower to start sales for Texas-based Howard Hughes Corp. (NYSE: HHC), which said in May that its two other towers under construction, the 171-unit Waiea project and the 311-unit Anaha project, were more than 75 percent sold. Prices for the owner-occupant units at Aeo, whose buyers will be required to use them as their principal residence for at least one year, begin at $405,016 for a 409-square-foot one-bath studio, $573,000 for a 612-square-foot one-bedroom, one-bath unit; $860,000 for an 860-square-foot two-bedroom, two-bath unit; and $1.39 million for a 1,239 square-foot three-bedroom, three-bath unit. The public lottery for the units will be held on Saturday at the Howard Hughes sales office at the IBM Building at 1240 Ala Moana Blvd., Suite 100. Sales, including an owner-occupant lottery, are sl ated to begin Saturday, July 18, for Aeʻo at 1001 Queen Street. 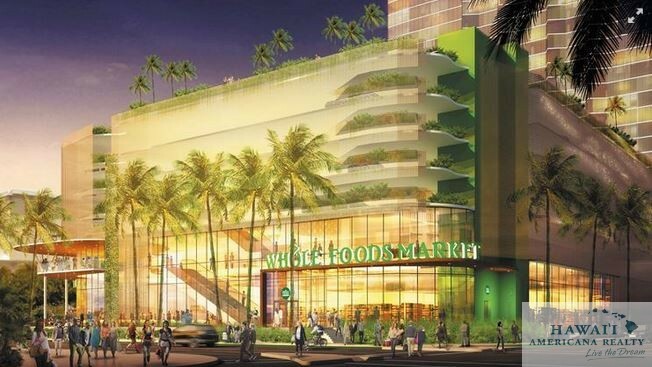 The 466-unit mixed-use condominium tower will be built at the corner of Queen and Kamakee streets, and include Hawaii’s future flagship Whole Foods Market. Construction is expected to be completed in 2018. Ae‘o will include studios and one-, two- and three-bedroom units ranging from 409 to 1,331 square feet, each including partial ocean views. Prices start in the low $400,000s. Amenities include a lap pool with ocean views, a dedicated family activity area with pool and children’s play area, a climate-controlled gym, an outdoor lanai for yoga and meditation, a wellness center with steam and sauna rooms, a theater, surfboard and bicycle storage, and outdoor dining spaces. Ae‘o (pronounced “eye-oh”) is named after the Hawaiian stilt bird. The building is designed by architects Bohlin Cywinski Jackson and will feature a contemporary exterior inspired by the patterns of local trade winds. About 450 people on Saturday entered the owner-occupant “lottery” to buy a condominium at Ae’o in Ward Village. 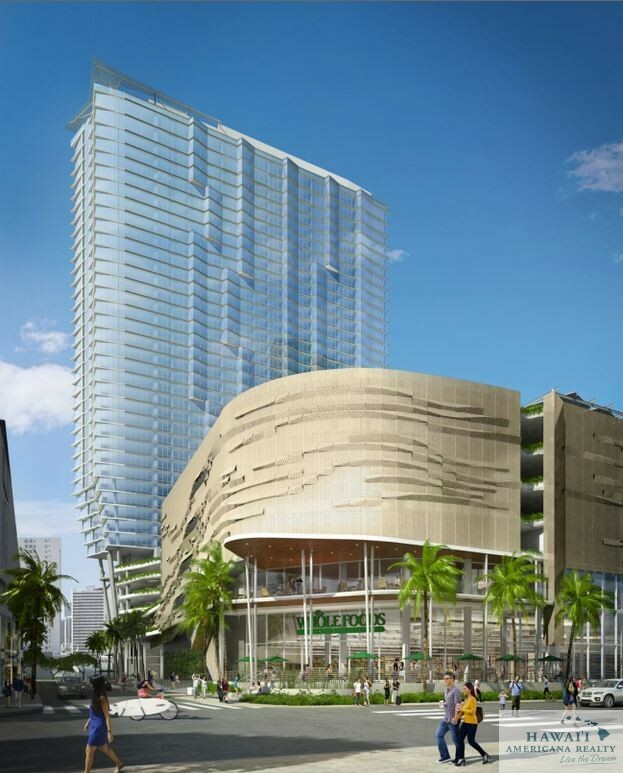 The 466-unit mixed-use condominium tower will be built at the corner of Queen Street and Kamakee Street, and includes Hawaii’s future flagship Whole Foods Market. KHON2 got a tour of one of the models. The development offers studios, one, two and three-bedroom units. Each will include partial ocean views and prices start in the low $400,000 range. KHON2 spoke to one woman who was at the lottery for her daughter. “She would just walk out of the condo, get her groceries go to restaurants, anything like that she would love it,” said Lindy Hashimoto. Amenities include a lap pool with ocean views, a family area with a pool, a gym and a wellness center with steam and sauna rooms. Ward Village received approval February 5, 2014 from the Hawai‘i Community Development Authority for its fifth mixed-use project, the second residential and commercial development in Phase Two of the Ward Village Master Plan. Located at the ‘ewa-makai corner of Queen Street and Kamake‘e Street, the building will include a highly-anticipated grocery store, new retail space and homes for local residents. The development will feature a 50,000 square-foot flagship Whole Foods Market that will serve both residents of Ward Village and the entire area as the specialty grocer’s largest store in Hawai‘i. The project will also include approximately 12,000 square-feet of additional retail space, district-wide parking and a tower with approximately 466 total residences. Phase Two will further enhance the transformation of Ward Village into an environmentally sustainable, pedestrian-friendly community in the heart of Honolulu. As Hawai‘i’s only Leadership in Energy and Environmental Design-Neighborhood Development (LEED-ND) Platinum-Certified project and the largest neighborhood development in the country to receive the prestigious certification, the core values of Ward Village and Whole Foods Market are well-aligned. The approved project will be designed by internationally recognized architects Bohlin Cywinski Jackson in collaboration with executive architect, Architects Hawai‘i, and a team of local consultants. The design will include indoor/outdoor seating at Whole Foods Market and be influenced by healthy, dynamic and nourishing natural elements. In addition, Halekauwila Street will become a truly walkable thoroughfare. The long term vision of the Ward Village Master Plan strives to create a world-class neighborhood that celebrates the land’s rich history and authentically reflecting the spirit of Hawai‘i. Ward Village will offer a carefully curated selection of local and national retailers, beautiful open spaces and a range of residences, encouraging a walkable and sustainable lifestyle within the 60-acre community.